Who invented Bifocals? The name of the person credited with inventing Bifocals is Benjamin Franklin (1706 - 1790). Benjamin Franklin is not only famous as the American inventor of Bifocals but also as a scientist and statesman. When were Bifocals invented? Benjamin Franklin invented Bifocals in 1784, during the First US Industrial Revolution (1700 - 1860) period of invention. He called his invention "double spectacles". Definition of Bifocals: Bifocals are defined as spectacles, or glasses, with lenses that are divided into two halves for correcting defective vision.. The upper half lens is used to look at objects that are far away. The lower half of the lens are used for reading, or for looking at objects that are nearer. Fact 1: Who invented Bifocals? The Bifocals was invented by Benjamin Franklin in 1784 during the First US Industrial Revolution era of inventions (1700 - 1860). He also invented the Franklin stove and the Lightening Rod. Fact 2: Who invented Bifocals? Prior to the invention of Bifocals in 1784, glass blowers produced "reading stones", a segment of a glass sphere that could be laid against reading material to magnify letters. Roger Bacon then invented spectacles (glasses) c.1267 to help people who suffered with poor eyesight. Fact 3: Who invented Bifocals? The first optical devices were convex lenses that bulged outward in the middle and they were used to correct far-sightedness. Fact 4: Who invented Bifocals? Concave lenses for nearsightedness (myopia) were invented by Nicholas of Cusa in 1451. The concave lenses were thinner at the center and thicker at the ends. Fact 5: Who invented Bifocals? The problem was that some people suffered from both myopia (shortsightedness) and presbyopia (longsightedness) and had to switch between pairs of glasses in order to read with one pair or to see distant objects with the second pair of glasses. Fact 6: Who invented Bifocals? The inventor of Bifocals, Benjamin Franklin, was one of those people that suffered from both myopia (shortsightedness) and presbyopia (longsightedness). Fact 7: Who invented Bifocals? Benjamin Franklin, was born in Boston, Massachusetts, on January 17, 1706 and died on April 17, 1790. Fact 8: Who invented Bifocals? The early years of Benjamin Franklin were spent in Boston, Massachusetts where he was raised by his family. His parents names were Josiah Franklin and Abiah Folger Franklin and Ben was the fifteenth of 17 children. Benjamin Franklin attended Boston Latin School for only two years but became self-educated through reading. Fact 9: Who invented Bifocals? His first job was at the age of just 10 years old when he worked in his father's candle shop. At the age of 12 years old he was then apprenticed to his brother James who was a Boston printer. Working at a printers Ben had access to numerous books and became extremely well read. Fact 10: Who invented Bifocals? In 1726 Benjamin Franklin established his own printing business and became a wealthy man. He had time to pursue his many interests and in 1742 created his first major invention, the Franklin stove. Fact 11: Who invented Bifocals? In 1743 Benjamin Franklin founded the American Philosophical Society encouraging scientific men to discuss their discoveries, inventions and theories. Fact 12: Who invented Bifocals? Fascinated by new ideas Benjamin Franklin invented the lightning rod conductor as part of his groundbreaking exploration of electricity. Fact 13: Who invented Bifocals? Benjamin Franklin retired from printing in 1747 and began manufacturing some of his new inventions and became involved in politics. It was an extremely volatile period in America that led to the American Revolution (1775–1783). On July 4, 1776 Benjamin Franklin, one of the 56 delegates to the Continental Congress, signed the Declaration of Independence. Fact 14: Who invented Bifocals? 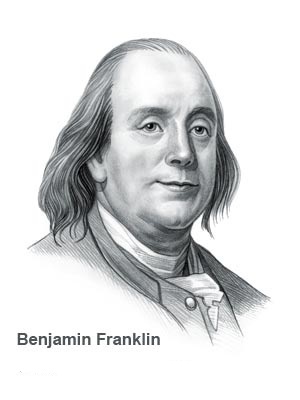 One year after the war ended Benjamin Franklin invented the Bifocals. His eyesight had never been good and he had trouble seeing both close up and far away. He suffered from both myopia (shortsightedness) and presbyopia (longsightedness) and needed two pairs of glasses. Fact 15: Who invented Bifocals? Benjamin Franklin found it increasingly irritating to keep changing his glasses in order to see clearly. This caused him particular annoyance when he was traveling when he sometimes read but often wanted look at the views. He decided to make just one pair of glasses that he could use for both close work and for distance. Fact 16: Who invented Bifocals? In 1784 Benjamin Franklin arranged for the lenses in his spectacles to be cut in half and each half were then fitted in the same circle to make a new pair of glasses that were suitable for both reading and for viewing distant objects. Benjamin Franklin called his invention "double spectacles". Fact 17: Who invented Bifocals? Benjamin Franklin reported in his correspondence that "I wear my spectacles constantly, I have only to move my eyes up or down, as I want to see distinctly far or near, the proper glass being always ready". Fact 18: Who invented Bifocals? Benjamin Franklin had been appointed as the first American Diplomat and as such traveled to France from 1776 to 1785. Following his invention of Bifocals in 1784 he reported that they "serve me best at table to see what I eat, not being the best to see the faces of those on the other side of the table who speak to me ... a sight of the movements in the features of him that speaks helps to explain, so that I understand French better by the help of my spectacles". Fact 19: Who invented Bifocals? The artist Charles Wilson Peale painted Benjamin Franklin in 1785. The portrait is the only one showing Franklin wearing double spectacles (split-lens bifocals). Fact 20: Who invented Bifocals? Benjamin Franklin died on May 14, 1790 in Philadelphia, at the age of 84. Approximately 20,000 people attended his funeral to pay their respects to a Founding Father of the United States of America, a great statesman and a famous inventor whose inventions included Bifocals. Who Invented Bifocals - Benjamin Franklin - Inventor - Invention - Definition - Meaning - Famous - Important - Bifocals History - Bifocals Timeline - Innovation - Significant - Development - First - Bifocals Definition - Kids - Facts - Information - Info - Who invented Bifocals - Dates - When - Why - Impact - Purpose - Use - New - Old - Amazing - Best - Definition - Bifocals Meaning - Awesome - Cool - American - History - Timeline - Who Invented Bifocals?